Yeah, but what about the 1970s? The 1970s were probably one of the most difficult decades for investors in the traditional asset classes. Stocks and bonds posted positive returns, but those returns were completey consumed by the sky high inflation which reached as high as 13% a year by 1979. Short-term T-bills even outperformed both stocks and bonds because of the rising interest rates environment. Basically the entire decade was a mess. Except for commodities, that is. The S&P Goldman Sachs Commodity Index (GSCI) does actually go back to 1970. And the returns in the 1970s were impressive – up 21% annually. These returns should be put into context, though. The price of oil was up 870% from the OPEC oil embargo. Once the price of gold became unpegged in 1973 it rose nearly 1,000% for the remainder of the decade. Commodities had nearly identical volatility characteristics in both periods, but after 1980 they returned less than ultra-safe cash equivalents. Cash-like returns with stock-like volatility for 35 years does not make for a very compelling long-term asset class. There are obvious supply and demand issues to consider, but I think the real reason they’re so volatile is because they’re basically in constant competition with technology. This is why I always say that commodities are trading vehicle, not a long-term investing vehicle. There’s a huge difference. If you’re truly worried about a 1970s-style price shock, then commodities will probably be your best bet. The question is: Can you wait that long for a low probability event that may never happen? I think it makes sense to plan for a wide range of possible outcomes with any portfolio. But I’m not sure banking on 1970s-style inflation at all times is one of them. I’m not saying it’s not possible. Anything is possible. I’m just not sure you want to carve out a huge piece of your portfolio for a single situation like that which is unique historically. 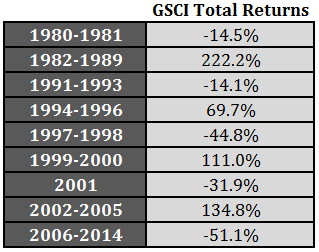 Almost 45% of the entire gains for the GSCI during the 45 year period from 1970-2014 were earned in the 1970s. Also, oil currently makes up around 47% of the GSCI index, with the remaining allocation spread fairly evenly among agriculture-based commodities and metals (gold is actually only 2% or so of the index). That’s a fairly big bet on the energy sector. There are alternatives that can protect investors from future inflation that are less volatile (TIPS) or offer a better return profile (REITs and even high quality dividend stocks) than commodities. Are Commodities for Trading or Investing? An Opportunity in Precious Metals Stocks? I’ve always found it hard to imagine commodities producing long term real returns since they are an input cost for most goods. How can you expect oil to increase in purchasing power when it is used to make most of the things you will be buying? Agreed. No income or dividends paid. No cash flows. Just part of the production process. And so many large corporations hedge these things out, they’re not investing in them. Financial advisors that bought into commodities as an asset class have been fooled. Commodities are an effective diversification tool for periods of unexpected high inflation. If an investor doesn’t want diversification —- which is perfectly valid —- there perhaps is no investment justification, as commodities are generally very efficiently priced in the markets. Nonetheless, if one were to look at the short and long term periods when CPI is high (the top 20% of inflationary periods over any horizon) the stock market underperforms itself during the other 80% of the periods. Hence, stocks do not pass through the cost of inflation very efficiently. Since 1997 (the inception of TIPs), the S&P has virtually zero Beta to CPI where as the Bloomberg Commodity Index has > 3 Beta. TIPs have less than .5 Beta. These periods of rising inflation encompass less than 20% of the monthly periods. The point is….as a tool for diversification when it is needed…it does work (along with rebalancing). As an investment with intrinsic value, whose value rises based on the productive gains of corporations and technology, commodities are not assets whose value rises as a result of productive gains. Ben – Indeed. Precious metals (ex-Gold) are also positively correlated to inflation. Perhaps the greater point is that some investment classes are good diversifiers, but they are not fundamentally good investments. That’s true. Over long enough time frames and with a periodic rebalance studies show it can actually help reduce vol. Just have to be in it for the long haul. Agree with the thrust of the article. Even in tactical allocation strategies which respond to different economic regimes, we’ve found little reason for including commodities (especially gold) in the asset mix. While there is some improvement in risk-adjusted returns when commodity correlation is low or negative to other assets, TIPs and REITs factor more effectively. The benefits of holding commodities in the 1970’s were obvious, but from a risk-adjusted viewpoint, continuing to hold over the long term has had little mathematical justification. Bessler and Wolff’s 2013 paper ‘Do Commodities Add Value in Multi-Asset Porfolios?’ is required reading on this subject. A valid approach would be to reduce degrees of freedom and forget about commodities altogether. That being said, a glance at current commodity/stock and commodity/bond ratios suggest that adding select commodities at this point is also a valid approach as Sharpes and Sortinos have looked good going forward from these levels in the past. Agreed. Some say the low correlation & high volatility is still a good reason to hold them but I agree there are much better ways to go about it. And that’s the thing — commodities could possibly be a good buy from here (or at some point in the future). That will probably rope people in once again to think they make sense as a static allocation. I just think it’s too much risk for too little reward. Take your volatility where you’re actually paid for it. True, but it’s also worth pointing out that it was nearly impossible for investors to gain commodities exposure in their portfolios w/o owning a seat on the futures exchange pre-1991. While not rolling returns, you can see them broken up in the data at the bottom of the page. Ben, have you read “The Little Book of Commodity Investing” and what’s the best way out there in your opinion to trade the market- through futures, ETFs or miners? I have not read that one before. I’ll have to take a look. I think any long-term commodities investment would have to have some sort of trend-following component in it to work. First time I have seen a shorter time period compared to a longer time period to show worse performance. Made me chuckle. I bet if it possible to start the performance period from 1930, returns for commodities, and oil in particular, would be measurably better. Maybe oil, but not commodities in general. I was primarily considering oil rather than commodities as a whole, so I am basically correct. True, but you have to buy them using futures to get the same or similar returns. The ETF proxies for these things don’t track very well. See USO. As you pointed out, the GSCI is heavily energy weighted, by design. But this makes the GSCI a poor vehicle for evaluating the merits of commodity investing, compared to equal weighted indexes such as the CCI (Continuous Commodity Index, with 17 equal-weighted members) or a smart beta total return index such as the SummerHaven (14 equal-weighted members, 7 selected for momentum and 7 for backwardation). Compared to the highly objectionable 19.9% volatility of the GSCI, the SummerHaven index has registered about 12% volatility since 1990 (the year to which it was back calculated). One might still conclude that commodities don’t justify themselves as an asset class. But drawing that conclusion using the GSCI is analogous to using, say, the Russell 2000 Growth Index to conclude that ‘equities are too volatile.’ Those equities may be, but other equity indexes are not. That’s valid. The Down Jones UBS Commodities Index is another one that’s more evenly distributed across the commodities and from 1991-2014 the vol is roughly 18%. No easy proxy I guess but maybe that’s the point. How to decide which commodities to own? If we analogize from equities, probably an index. But since only two or three dozen commodities have adequate liquidity, and the energy complex dominates on a trade-weighted basis, an equal weighted commodity index makes the most sense until capacity limits are reached (not a problem now with commodities deeply unpopular). I run an inflation hedge model that pits commodities vs. REITs. It holds REITS about 60% of the time. But commodities still take the lead the other 40% of the time. It’s about what one might expect, given the episodic, spiky nature of commodity outperformance. I’ve also seen commodities vs. T-bond models, under the theory that what’s good for commodities (inflation) is bad for bonds and vice versa. Some criterion is needed to filter out the long, dull periods when commodities are dead in the water. Just a simple trend following strategy? Thoughts on TIPS as a real asset? Not a ton of historical data on TIPS. Yes, it’s a simple trend following strategy for the Commods vs REITs model. Like Ray Dalio, I’ve simulated TIPS back to the 1950s with a homebrew inflation expectations model. As best I can see, long-term TIPS (say 10-year) don’t make a lot of sense. If interest rates rise, long duration means TIPS prices decline, even with their inflation compensation. If rates fall, conventional T-notes outperform TIPS. Short TIPS (say 1-2 yrs) dispense with the duration problem, but they’re quite illiquid. Conventional short-term bills or notes plus a small inflation-hedge allocation (such as commodities vs REITs) is easier to implement and outperforms TIPS as well. FRED has yield data on all TIPS since the first issue in 1997, from which total returns can be derived.